Could time travel really take place? 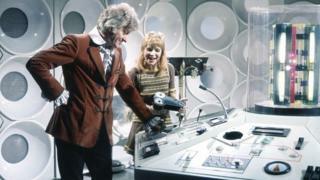 Image caption Could you travel back in time to see Dr Who, played by Jon Pertwee, travelling back in time in 1972? When you think of time travel what comes to mind? Doctor Who hurtling through the centuries, hitting the controls inside the Tardis like some kind of metaphysical pinball machine? Or does it raise images of time-flying contraptions built by Victorians in velvet smoking jackets? Or time machines made from souped-up sports cars like in the Back to the Future movies? But could it ever really happen? The probability of time travel is being investigated by academics at the University of Birmingham, one aspect of an international research programme into the nature of time involving universities in Australia, the United States, Germany, the Netherlands and Turkey. To begin with the disappointing part, the team at the University of Birmingham are not secretly building a time machine. There is no time transporter being constructed in the West Midlands. But some very big ideas are under examination. Because once you start delving into the idea of time you begin to raise questions about physics and philosophy and the nature of reality. Nikk Effingham, head of the philosophy department, is leading the project with Alastair Wilson, whose specialisms include the philosophy of physics. The likelihood of time travel might be "infinitesimal", says Dr Effingham, but it's not impossible. And he says there is an inherent value in exploring an "intrinsically interesting set of questions". There can be unexpected outcomes from such open-ended investigations. Even some apparently abtruse ideas have direct applications. Part of the international study is examining how fruit flies might perceive time. The purpose is to understand more about a sense of time and sequencing, a big issue in some human degenerative disorders. The Birmingham project will have to address some classic arguments against time travel, such as the "grandfather paradox". This argues that if someone could go back in time they could kill their own grandparent and so make it impossible for the time traveller to be born. And if they were never born they could never go back and time travel becomes an impossibility. But that's not game, set and match, because philosophers have a counter argument to evaluate. That says that to prevent such a self-erasing process, any time travellers would find themselves endlessly prevented from killing their grandparent, the gun would jam or the wrong person would be targeted, so that the lines of time would not be disrupted. Another theory is that changes made by a time traveller would create a chain of events in another parallel universe, rather than alter the original world they left. This is related to the "many worlds" theory that suggests that we occupy only one version of reality and that an infinite number of other possibilities are being played out in parallel universes. The traveller in time could make changes that trigger new sequences of events in these many different worlds, without disrupting their original timeline. It's a philosophical version of the Sliding Doors film, with different choices playing out different stories. Dr Wilson says that examining time travel is a way of addressing questions about fundamental physics. It means thinking about time not as a way of measuring the passing of hours and days, but as a dimension more like space. If you could travel within this concept of time, says Dr Wilson, it wouldn't be "walking into a box that took you places". Instead it might be some kind of portal, loops in time, where someone could travel and then come back to the same place - described by physicists as "closed time-like curves". Could this ever really happen? "Our best physics at the moment leaves it open," says Dr Wilson. Image caption Could time travel be about a location near a black hole, rather than a time machine? "If it occurred, it might be in some exotic region of the universe, a very long way away, somewhere near a black hole with high concentrations of energy. "It's not so much inventing a time machine as discovering a location." Bradford Skow at the Massachusetts Institute of Technology says "even if time travel is consistent with the laws of physics", it still doesn't mean there are going to be people in time machines. Prof Skow has recently published a book about concepts of time, Objective Becoming, which rejects the idea that time "passes" or is somehow in motion. He argues that past moments or experiences are just as real as the present, but are inaccessible in another part of time. The fascination with time also reflects how intrinsic it is to human experience and all living things. Time is tied to the natural rhythms of day and night, birth and death, the beating of a heart, down to the smallest units of nature and to the origin of the universe. "Our best clocks use the vibration of an atom to measure time, atoms which have been vibrating since they were created billions of years ago," says Dr Wilson. But there is another awkward argument against the idea that time travel might become possible in the distant future as technology advances. If that was going to happen, then why haven't we met those future humans coming back to see us here in their past? Even if the prospects of bumping into a time traveller remain remote, Dr Wilson says such intellectual journeys into the unknown have their own value. "People divide into those who ask, 'Is there a practical possibility of this happening in my lifetime?' and when you say 'no', cease to be interested. "And then there are lots of other people who are interested in the questions for their own sake and because they connect with some fundamental questions about humanity." Will we ever turn back the clocks? Only time will tell.